Band should be on around midnight! 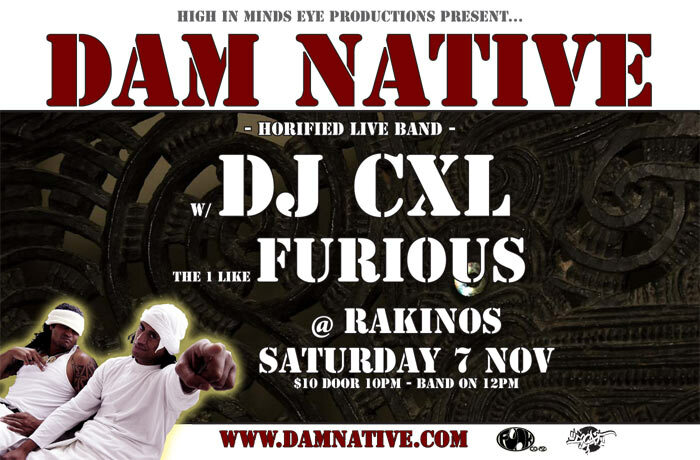 Dam Native live band make a rare appearance after a delay while working on videos for the upcoming album “Aotearoa… Nobody Does It Better”… fresh and bursting with native wairua, come and check the band out for a super low price of $5 before 11pm, we just want to pack it out, and have a slamming gig! The one like Furious will work the crowd into a lather from 10pm onwards until just after midnight when the band of rolling stones DAM N8V will take the stage, followed by DJ CXL into the wee small hours. Post by Tomachi, on October 7, 2009 at 1:34 am, filed under Gigs. Kiaora my brothers brother craze in the vicinity finally getting this internet susd kapai keen for colabs my natives been keeping iot native on the east hows every one been pairawaatu ki ao waiata aroha ki whanau ai hola back brothers and sisters dam native will never die so stop fighting it .